As such a large part of our day is spent at work, it should be obvious that job satisfaction and employee performance are linked to the quality of the office environment. A well thought-out workplace not only improves employee productivity but also increases staff retention too. To make some improvements to your working environment, take a few moments to cast an eye around your office and consider the 7 points below. Provide your staff with ergonomically designed office chairs to reduce aches and pains. It?s particularly important for the chairs to be adjustable if you have a hot-desking policy in place. A good quality office chair will last at least twice as long as a poorer quality one. Office furniture overall needs updating every so often, not only to keep apace with changing technology but also to give an uplift to the office. Add panels and screens to provide some privacy and sound proofing. They can be added in various heights to achieve a good balance of privacy vs. interaction. 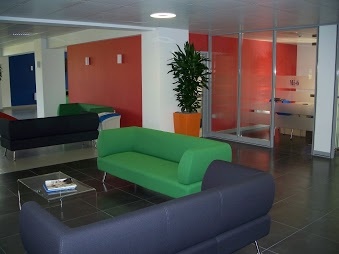 And don?t just opt for boring grey or navy blue; add some vibrancy to the office with shades of lime green or orange. Adding some colour can really bring an office to life and make a huge difference to everyone?s well-being. There are many opportunities to add colour in an office, you can paint patterns on walls, add coloured blinds, install funky furniture or use brightly coloured partitioning. Re-decorating an office can be a sign that things can change and signal exciting new phases of the business. Not only an eye-sore but also a serious health and safety risk. It?s simply not acceptable to be using gaffer tape in an office environment. Get this properly addressed with trunking, new office desks or installation of additional sockets. Why not ask us to come along and take a look? We've got all sorts of solutions to make your workplace a safe place. Give staff a nice place to take a break. The breakout area doesn't need to be big, even the smallest of breakout areas can provide a welcome break away from your desk. They are much more likely to come back to their desk feeling ready to take on the rest of the day. Say no to kitchen politicsIs your office kitchen the hub of office politics? Do you have posters warning of the consequences of not washing up and post it notes stuck all over the fridge? Why not provide a dishwasher, bigger fridge and more storage space in the kitchen? Plain cubicle walls aren't any fun. Let your staff add those little personal touches that make them feel more at home. It could be family pictures, uplifting quotes, souvenirs or pot plants.